I replaced an ink cartridge, but my product shows that the same ink is expended. What should I do? The ink cartridges may not have been installed using the correct procedure or they may not be seated correctly. Follow the instructions below to correctly install and reseat the ink cartridges. If the ink expended message is on the screen, select the option to replace the ink cartridge and press the OK button again. If the ink expended message is not on the screen, press the home button, select Setup > Maintenance > Ink Cartridge(s) replacement. Press the OK button and the start button. 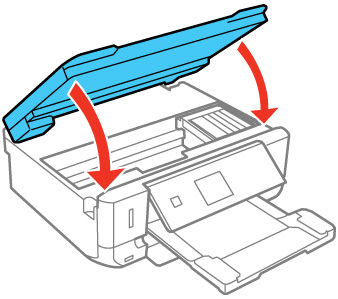 When the message to replace the ink cartridges appears on the screen, lift up the scanner unit. Verify that the ink cartridges are in the ink changing position in the center of the printer. If they are not, close the scanner unit and repeat step 2 and 3. 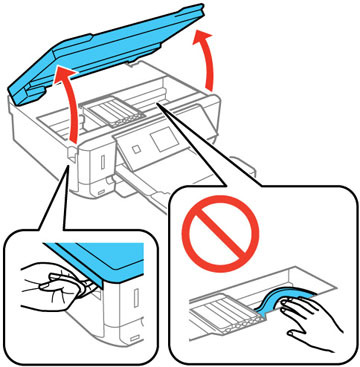 Remove all the ink cartridges by pushing in the blue tab to unlock the ink cartridge you are replacing. Then lift the bottom of the ink cartridge to remove it. After all the ink cartridges have been removed, reinsert them one by one and press down until it clicks into place. Note: Make sure not to place the Photo Black (PBK) ink cartridge into the Black (BK) ink cartridge slot. Press the start button. The printer starts charging the ink. Published: 29-Mar-2018 Was this helpful​? Thank you for the feedback!